Take places like Syria, where approximately 700 local organizations and diaspora groups have filled the void left by the absence of international relief organizations, which have been largely unable to operate in besieged areas since the conflict began. In Yemen, suspicion and mistrust by governments, armed groups, and communities themselves compel international aid organizations to work almost exclusively through local partners. According to surveys done by the accountability project Ground Truth, only one in six of those affected by the 2015 earthquake in Nepal and one in 16 during the early response to the recent Ebola outbreak in West Africa felt that their needs were being met by aid organizations. Efforts to recapture this legitimacy have focused on improving the system already in place, rather than tackling its more fundamental assumptions, power dynamics, and incentives. As a result, and despite a decade of reforms, the sector still falls short in addressing the world’s most enduring crises and is also not doing a good job in the eyes of the people it aims to help. The history of humanitarian action—both Western and non-Western—suggests that differing notions of “humanitarianism” have played out across regions and cultures. Chinese humanitarianism served to legitimize the empire and then the state, Arab humanitarianism has deep roots in religious obligation, and contemporary Cuban humanitarianism draws upon a political culture that stresses the importance of solidarity with the poor. Although the practical expression of humanitarianism—caring for the sick and wounded, providing food and shelter, and minimizing harm—has been present across time and tradition, it has always taken many forms. Only in the last century has a more formal and institutionalized humanitarianism emerged, reflecting Western interpretations of voluntarism and charity and ideas of how assistance should be provided. This architecture has changed very little since the end of World War II. Meanwhile, the character of conflict and the nature of disasters have changed significantly since then. Disasters are more intense, and their destruction more costly. Conflicts are overwhelmingly internal rather than international, fought with new technologies, and dominated by non-state actors. Crises last longer, and distinctions between emergency response and longer term development are no longer relevant. Urban violence is on the rise and large-scale and long-term displacement is one of the largest global challenges of our time. There are also massive changes in who is funding, organizing, and delivering humanitarian aid. Donors outside of the OECD’s Development Assistance Committee such as China, Turkey, and the Gulf states have become more prominent givers. States have become more assertive responders. Regional organizations have established humanitarian departments, and local organizations and businesses are providing substantial amounts of aid, even in sensitive conflict zones, where they have had more success delivering assistance than their international counterparts. Remittances to places like Syria and Somalia for crisis response and recovery are more significant, consistent, and reliable than international aid or foreign direct investment. Such changes are significantly shifting the relationship between aid givers and aid recipients and should be shifting humanitarian operations, but are not. A decade of reforms have aimed at improving the system already in place, ignoring the underlying assumptions and institutions on which it operates. Reforms such as “humanitarian clusters” and the upgraded United Nations Central Emergency Response Fund following the response failures in the Darfur conflict and the 2004 Indian Ocean tsunami response built on the structures established by the UN under General Assembly Resolution 46/182 more than a decade before. 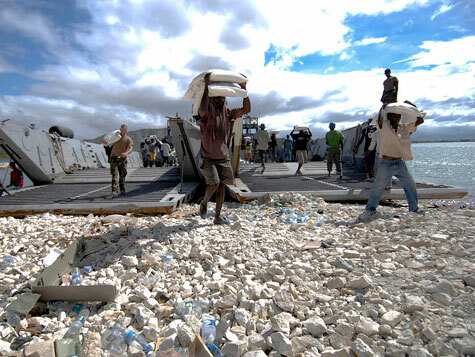 The subsequent set of reforms initiated under the 2010 “Transformative Agenda,” including the designation of the Level 3, or L3, emergency to denote the most severe and large-scale crises following the Haiti earthquake, did more of the same. And, as each emergency highlights the same problems and flaws, improvements to system-wide performance remain flat and uneven. The Ebola crisis, where lessons from past crises and established humanitarian good practice did little to prevent response failures that may have contributed to the spread of the disease, is but one example. So what’s preventing change? For one, money and power concentrated at the center in an “oligopoly” of a limited number of donors and a limited number of recipients that drive a preoccupation with growth and market share, and create powerful disincentives for handing over responsibility to other organizations that could serve as competition for funding. And, while there is much talk of accountability to affected populations, there is an enduring cultural paternalism that views indigenous solutions to crises as inferior to international ones. As a result, most engagement with local NGOs is in the form of sub-contracting arrangements and the cultural, procedural, and linguistic barriers for more constructive engagement are high. In places like Syria, donors have lost valuable time in the search for partners that meet their criteria, instead of adapting to the context and being more flexible in their choices. There is also a tendency to believe that a homogeneous humanitarian sector is a better one; that those operating outside the formal system are keen to join it. On their part, the rising humanitarian donors and aid organizations are not at all interested in simply supplementing the traditional aid system. They challenge the universality of humanitarian principles and coordination structures as vehicles for unwelcome Western bias and intervention. They opt for their own home-grown structures and funding streams, which they feel are more legitimate. This was the case during the Ebola outbreak, where affected governments and businesses established their own response coordination systems. Instead of being expanded, the proverbial humanitarian tent is being pitched elsewhere. This is also not to say we should assume that local response is always a more effective one; there simply needs to be a more honest and realistic assessment about the strengths and limitations of different types of responders, and a more explicit recognition of the complexities that such engagement involves. The process leading up to the 2016 World Humanitarian Summit has been successful in catalyzing a sector-wide debate on the effectiveness of humanitarian action. In doing so, it has generated much critical discussion on the failings of the system, some appetite for change, and the best opportunity in 25 years to rethink the foundations on which the system operates. It is up to the governments and humanitarian agencies and organizations that make up the system to use this opportunity to let go of the outdated assumptions, power dynamics, and incentives that hold it back. Internal system reform, whether of mandate or mindset, must be where these changes should start. This article is based on Time to Let Go: Remaking Humanitarian Action for the Modern Era, from the Humanitarian Policy Group of the Overseas Development Institute (ODI). Christina Bennett, the report’s lead author, is a Research Fellow at ODI.